Cold-based glacial geomorphology comprises the analysis of landforms molded significantly by the action of cold-based glaciers. ​Landforms showing clear evidence of prior cold-based glaciation are rare since cold-based glacial ice cover tends to be protective of pre-existing landscape features. The erosive potential of cold-based glaciers is reduced because glacial ice, when frozen to stable ground, does not slide and thus does not tend to shift rock or drag along loose or abrasive material. 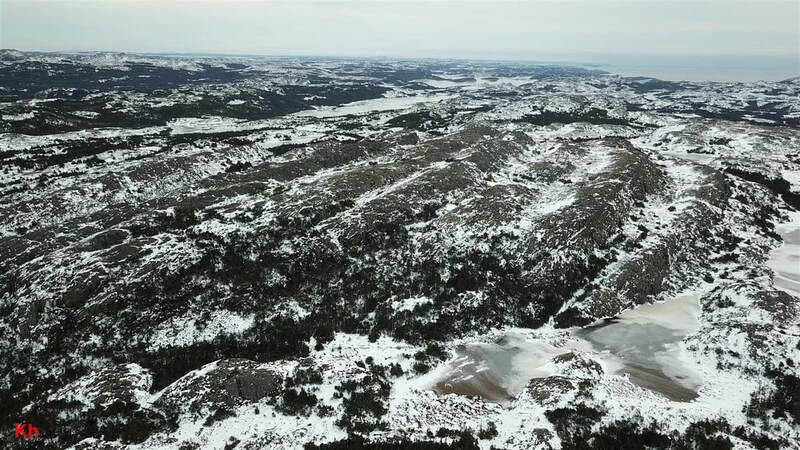 In contrast to conventional expectation, significant areas of Newfoundland's Avalon Peninsula show prominent indications of erosion by cold-based glaciers. The indicated cold-based glacial erosion mainly affected bedrock and occurred during final deglaciation at the end of the Pleistocene, leaving remarkably well preserved relics. The affected areas show a distinctive geomorphology that can be linked to paleoclimate, subglacial hydrogeology and the physics and thermodynamics of cold glaciation. The above photo shows a flattened, elevated area of exposed bedrock and thin vegetation. The area was smoothed by basal-sliding glacial (warm-based) erosion during the Pleistocene and most of the resultant till was removed to lower elevations. A few of the blocks visible in the photo are artifacts of rock transfer by warm-based glacial ice flow (erratics), but the majority of the surface roughness was caused by frost heave. The abundant frost-heaved blocks (monoliths) frequently show evidence of having been loaded or shifted by glacial ice. It is apparent that the surface was roughened in a subglacial environment and that the disturbed bedrock was affected by loading from beneath (frost heave) and by loading tangential to the surface (glacier mechanical action). 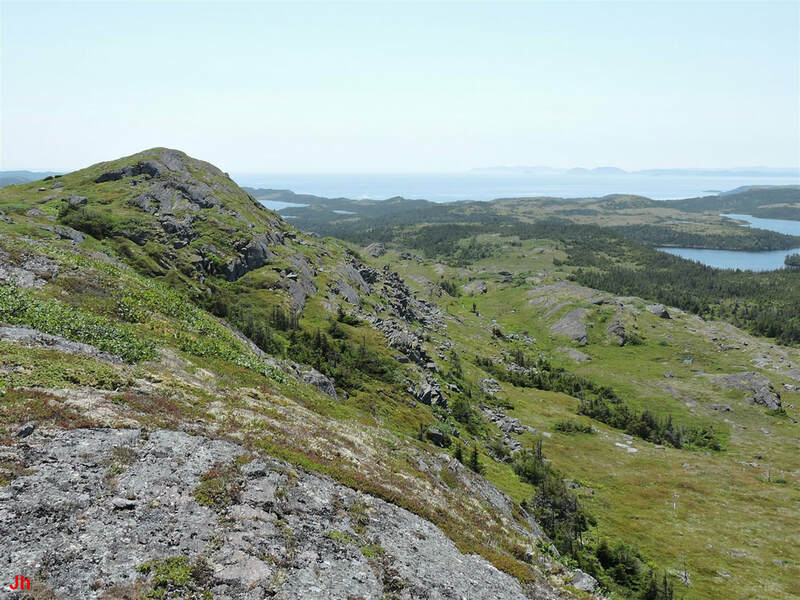 The illustrated scene represents an example of cold-based glacial geomorphology and is indicative of action that took place over wide areas of the Avalon Peninsula at the end of the Pleistocene, during the Younger Dryas cold interval. Two key points relate to the erosion evident in the above scene and to cold-based glacial erosion seen elsewhere on the Avalon. 1) The erosion is a shallow surface effect. All of the cold-based glacial erosion seen on the Avalon Peninsula appears to extend downward to a depth of the order of only one meter. This observation comes from the measurement of the depth of fissures and the heights of frost-heaved monoliths. Two meters represents an approximate upper limit for the depth of bedrock fracture by subglacial frost wedging. There is no lower depth limit and very small frost-heave features can readily be observed. 2) Groundwater appears to have played an essential role in all recognizable instances of bedrock erosion by cold-based glacial action. The above photo shows an aerial view of a cliff that was initially formed when warm-based glacial ice sheared off the upper layers of a sequence of sloping thick strata of sedimentary rock (see "Precursor structures" below). Scale on the photo is indicated by the orange strap (1.0 m long) seen at the base of the cliff. The illustrated scene is not an example of plucking by warm-based glacial ice flow. The topography of the area and the location's proximity to the coast implies that warm-based glacial ice would have moved in a direction about 90 degrees to the illustrated cliff face (toward the left or upper left in the above photo). The bedrock at the top of the cliff shows evidence of erosion by ice extrusion (center of photo) and numerous large frost-heaved monoliths are found on the cliff-top bedrock surface. Some of these monoliths (not plainly visible in the overhead view) protrude vertically upward close to the edge of the cliff. The heavily eroded cliff face includes examples of bedrock frost heave with rotation. Some of the rotated blocks are shifted in a direction toward the lower left corner of the photo, while some blocks are shifted toward the lower right corner of the photo. In several instances, rotated blocks were raised above the level of ambient bedrock, demonstrating a combination of vertical bedrock frost heave and frost heave with rotation. Subglacial ice plume action can be seen in the center region of the cliff face, with blocks aligned by ice emerging from the cliff face at a 45 degree angle to the vertical. The erosion of the cliff was apparently caused by groundwater approaching the cliff face while the cliff face was embedded deep within a cold glacier. Diminishing confinement of rock near the cliff face, along with diminishing temperature, allowed ice segregation to commence and the resulting accumulations of confined ice shattered and shifted the bedrock. Ambient glacial ice held dislodged blocks of bedrock in place at precarious angles until deglaciation completed with an absence of any significant basal sliding. 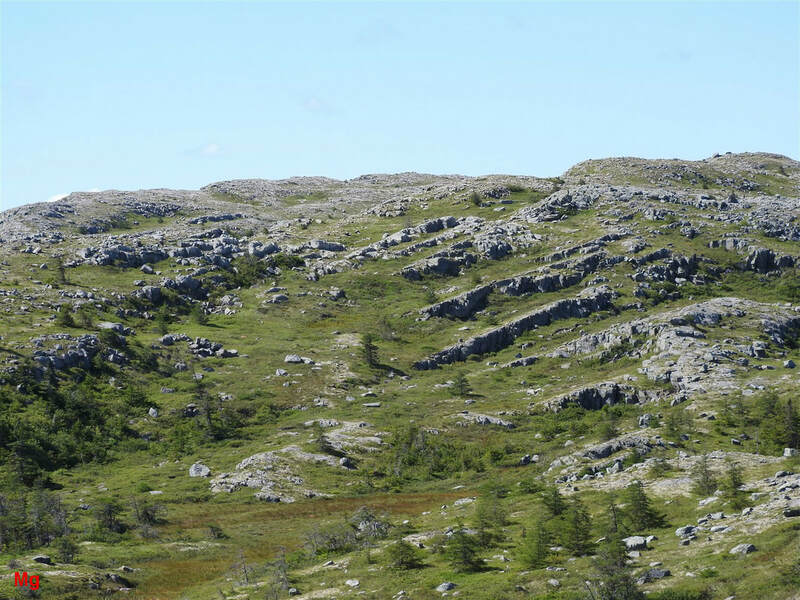 The above-illustrated scene provides an example of several of the defining characteristics of cold-based glacial geomorphology demonstrated on the Avalon Peninsula. 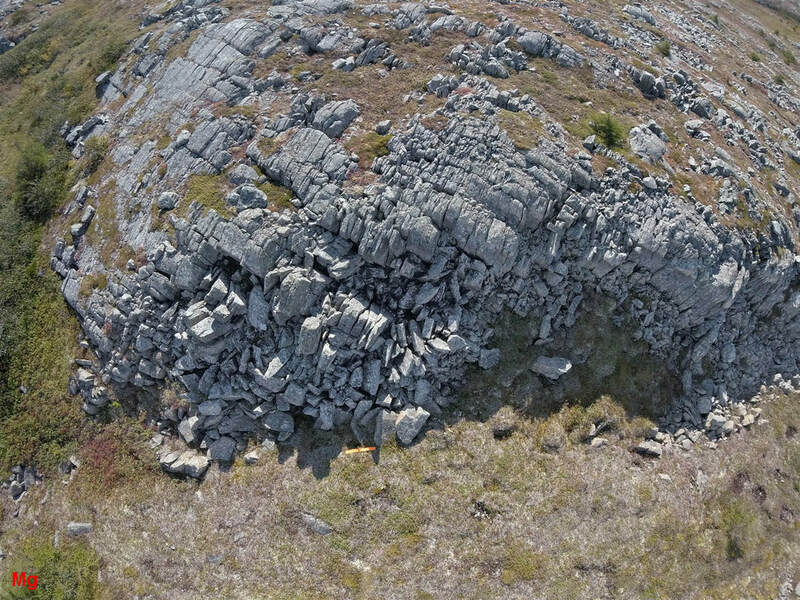 Much of the bedrock exposed on the Avalon Peninsula shows evidence of folding. In areas where bedrock is layered, synclines and anticlines can be identified, generally striking northeast and often separated by distances of the order of a few kilometers. Homoclines lie between the synclines and anticlines and most of the areas showing abundant occurrence of bedrock frost heave lie on homoclines that have been deeply eroded by warm-based glaciers. These glacially eroded homoclines are considered to be the primary precursor structures on which cold-based glacial geomorphology is superimposed. The diagram shown above illustrates a typical layout. The indicated layering in the rock can represent successive beds of sedimentary deposition (deposition from water) or they can represent successive volcanic flows or instances of sequential subaerial deposition of layers of tuff or ignimbrite. The indicated jointing (vertical lines) represent planes of rock cleavage following foliation or cross joints. The above photo shows the remnants of a homocline in layered sedimentary rock following erosion of the rock by warm-based glacial ice moving in basal sliding mode. The bedrock is of Ediacaran age and has been subjected to hundreds of millions of years of erosion, culminating in the Pleistocene glaciations. The repeating low cliffs are an artifact of the final episode of warm-based glacial erosion before the Holocene. Cliffs like these are prime sites for demonstrating instances of subglacial bedrock frost heave that occurred when glaciers froze to the ground during the Younger Dryas cold interval. Bedrock frost heave and related cold-based glacial erosion took place, both on the cliff faces and on the sloping bedrock leading up to the cliff faces. 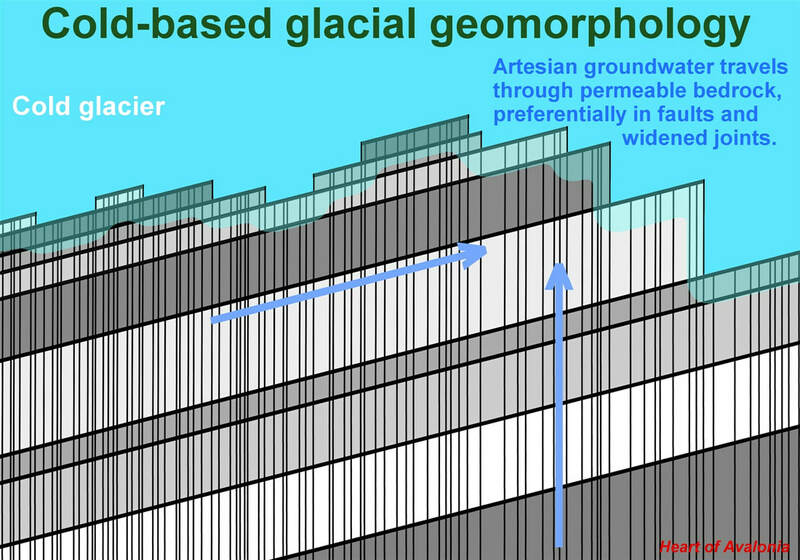 The above illustration summarizes a typical precursor environment favoring development of cold-based glacial erosion features. A roughened initial topography created by bedrock failure along multiple planes of weakness oriented at steep relative angles provides areas of reduced rock confinement (example shown in green circle above). The reduced degree of confinement favors widening of joints and creation of voids where ice segregation and resultant bedrock frost heave can readily commence. Mechanical stress imparted by shear loading of rock surfaces by deforming cold glacial ice also acts more effectively to fracture and shift bedrock when the bedrock is less confined. During the Younger Dryas cold interval at the end of the Pleistocene, a freezing front was driven downward through thinning glaciers, eventually reaching and penetrating subglacial bedrock. The above diagram illustrates the frost-heave zone, defined as the thickness of bedrock between the glacier base and the freezing front. Only water that is inhibited in freezing (supercooled) can exist in a noncrystalline state within the frost-heave zone. 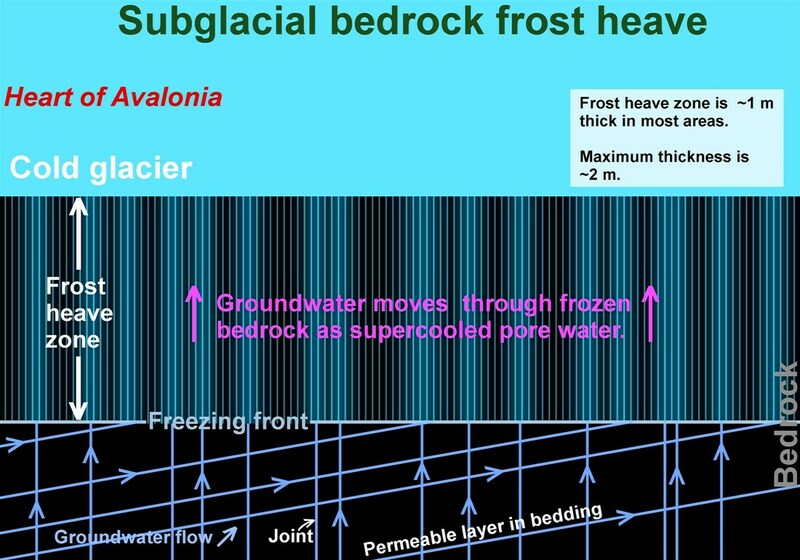 Supercooled water, prevented from crystallizing by confinement within narrow channels, converts to ice upon entering voids or weakly confined rock in the frost-heave zone, causing subglacial bedrock frost heave (see Crystal Growth Pressure). The thickness of the frost-heave zone is controlled by the balance between heat flow into the zone from below and heat flow out of the zone into the overlying glacier. Observations of fissure depths and heights of frost-heaved monoliths suggest that the frost-heave zone is usually about 1 meter thick, ranging from 0.5 m thick to 2 m thick. It is possible that these observations understate the thickness of the frost-heave zone and that conditions of rock confinement might alternatively control fissure depths and heights of monoliths. An excessively thick zone of frozen bedrock would slow migration of groundwater toward the glacier base and thereby inhibit frost heave. It appears reasonable to conclude that, in areas where bedrock frost heave is pronounced, the thickness of the frost heave zone does not deviate excessively from the range of values indicated in the above diagram. As illustrated in the above diagram, groundwater moves from depth toward the frost-heave zone and glacier base. Groundwater over-pressure is provided by thinning glaciers and a consequent accumulating reduction in hydrostatic pressure at the glacier base. Observations suggest that groundwater flow is channeled by weaknesses in the bedrock. The distribution of frost-heave features on the surface is often highly nonuniform and is sometimes distinctly concentrated along widened joints. An example of bedrock frost heave occurring preferentially along a cross joint is provided in the following photo. The above diagram summarizes the process of groundwater migration leading to subglacial bedrock frost heave. Groundwater below the freezing front flows as liquid water in joints and in weakly-bonded contact layers separating adjacent strata. Joints or layers between strata that have undergone lateral slippage and become faults during periods of tectonic stress or during glacial loading/unloading are particularly susceptible to forming conduits for groundwater transfer. When groundwater reaches the freezing front, flow channels wider than a few tens of nanometers become candidates for the initiation of ice segregation. Once ice crystals have formed in a flow channel, migration of water molecules along the channel is slowed, but not terminated. Water molecules can continue to migrate along the boundary layer (see Crystal Growth Pressure) between rock and ice. It is important to recognize that the freezing of permeable bedrock slows, but does not halt, groundwater migration through the rock. When considering frost heave processes occurring on centimeters-long length scales over centuries-long time scales, water migration rates that might be considered negligible or zero in a laboratory environment or in a monitored natural environment could become important in a subglacial paleo-environment. As illustrated in the above diagram, it is reasonable to assume that groundwater migration through frozen bedrock will tend to concentrate at locations (joints, bedding contacts) that provide sources of flowing liquid water just below the freezing front. It is also reasonable to assume that, upon crossing the freezing front, groundwater migration paths will spread outward from concentrated linear sources as water molecules are forced to begin moving through frozen bedrock by diffusion. Bedrock fracture accompanying ice segregation will presumably open up new paths for accelerated groundwater diffusion and ice creep. The ice-segregation/bedrock-frost-heave environment (frost heave zone) is therefore characterized by positive feedback loops and instability. 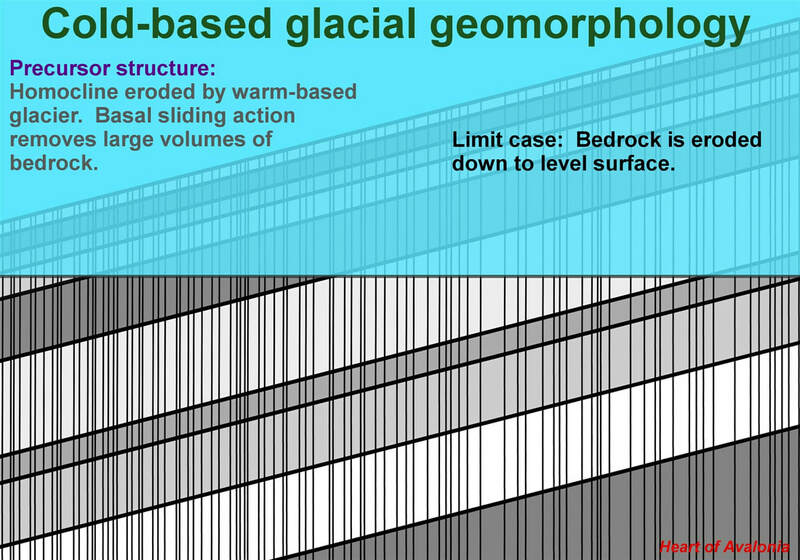 Bedrock permeability is a key parameter affecting the susceptibility of a bedrock structure to subglacial frost heave. In effect, bedrock possesses two potentially separate elements of permeability. The first element of permeability relates to the nature and abundance of flow paths (joints, faults) for groundwater travelling in the liquid state at depths lying below the freezing front. The second element of permeability relates to the nature and density of linked pores capable of transmitting supercooled water via diffusion when the freezing front is reached and bedrock becomes frozen. Within the context of the Frost-heaved Bedrock project to date, specific factors controlling bedrock permeability or susceptibility to bedrock frost heave have not been observed or determined. However, it has been observed that layered bedrock structures can demonstrate clear differences in frost-heave susceptibility (hence, by inference, permeability) between adjacent bedrock layers. The above diagram illustrates how a stratified bedrock structure can be divided into layers of differing permeability (darker shading signifies lower permeability). An valid independent method to determine the relevant permeability parameters of a particular rock layer has not been worked out. However, aspects of the permeability affecting vulnerability to bedrock frost heave can potentially be inferred for individual layers by observing the degree of bedrock disruption by subglacial bedrock frost heave, taking into account the geometry of bedrock exposure. The landform shown in the above aerial view is a portion of a homocline on the Isthmus of Avalon. The field of view of the photo is about 1 km wide at the middle of the frame. The illustrated structure is part of a larger recognizable homocline feature extending about 5.5 km along strike and about 1 km wide. Basal slip glacial erosion has exposed the visible layered structure seen above, but glacial erosion has also obliterated some portions of the structure lying in the background. Analysis of the rock in the above-illustrated feature indicates that the feature is an excellent candidate for observing the potential effects of differing bedrock permeabilities on subglacial bedrock frost heave. The homocline consists of a sequence of layers of thickly bedded tuff and ignimbrite dipping at an angle of 32 degrees. The volcanic rock is of Ediacaran age. The rock comprising individual layers seems reasonably consistent within the layers, but is readily distinguishable from rock in adjacent layers by color or clast distribution. Presumably, each layer represents an individual subaerial volcanic explosion. The rock within layers is well indurated, but observations suggest that there is little bonding between layers. The structure was regionally metamorphosed and incorporates a well developed joint system including longitudinal joints following foliation and abundant cross joints. The landform pictured above shows substantial areas of bedrock disruption by frost heave. However, the occurrence of bedrock frost heave is distinctly correlated with the individual layers. Some layers show no significant impact from frost heave while other layers are severely impacted. The above diagram illustrates three key elements of cold-based glacial erosion (frost-heaved monoliths, fissures and rotated frost-heaved blocks) occurring on a permeable bedrock layer sandwiched between adjacent layers having lesser permeability. The argument that frost heave preferentially occurs on a high-permeability bedrock layer is flawed (circular) when the relative permeability of the individual layers is not determined by an independent measurement. To gain any benefit from attempting to work backward and infer permeability from frost-heave observations, it is important to exclude alternative causes of variations in frost heave intensity between layers. Two main alternative factors affecting the development of frost-heave features are: 1) The ice pressure environment imposed by the overlying glacier. 2) The geometry of confinement of the frost-heave affected bedrock. One way of controlling for these alternative factors is to focus observations on frost-heave occurrences where ambient ice pressure and bedrock confinement do not change appreciably when crossing a boundary between rock layers. Examples of such occurrences have been found on the layered volcanic landform pictured in the above aerial photograph. A specific example is illustrated and discussed below. The above photo shows an asymmetric valley carved from a homocline (part of the feature on the Isthmus of Avalon, described above) comprising layered volcanic rock. The valley was formed by warm-based glacial ice moving toward the coast seen in the background. The hill on the left rises about 50 m above the bottom of the small valley to the right. A long strip of roughened bedrock can be seen near the center of the frame. This roughened area corresponds to a recognizably distinct layer in the sequence of tilted layers of ignimbrite and tuff comprising the eroded homocline. The roughened area has been severely disrupted by bedrock frost heave. The disrupted area includes large frost-heaved monoliths and abundant examples of bedrock frost heave with rotation. The frost-heave-disturbed bedrock layer is overlain by several volcanic bedrock layers (tuff and ignimbrite) showing little evidence of disruption by frost heave and is underlain by a layer of ignimbrite that demonstrates high resistance to bedrock frost heave. The geometry of the landform was shaped largely by the erosive action of warm-based glacial ice and the slope of the ridge to the left of the small valley is glacially defined and approximately constant from top to bottom. This ice-eroded slope cuts across multiple beds dipping downward toward the left of the frame. The low-rising small ridge on the right side of the valley shows a smooth, flat surface dipping at 33 degrees. This surface corresponds to a bedding plane that was exposed by basal-sliding glacial erosion. The layout of the above-pictured landform shows no indication that glacial ice pressure or bedrock confinement geometry would be expected to change abruptly along the horizontal border corresponding to the transition from a relatively smooth bedrock surface to a frost-heave disrupted surface. The only obvious change at the horizontal border is a change in bedrock composition, corresponding to the boundary between adjacent beds. The above two photos illustrate the sharp contrast in bedrock surface conditions observed when crossing the boundary between adjacent volcanic layers exposed on the left (right-facing) slope of the small valley described in the preceding discussion. The lower photo (about 4 m, top to bottom) shows the roughened area near the base of the slope where bedrock frost heave is prevalent. 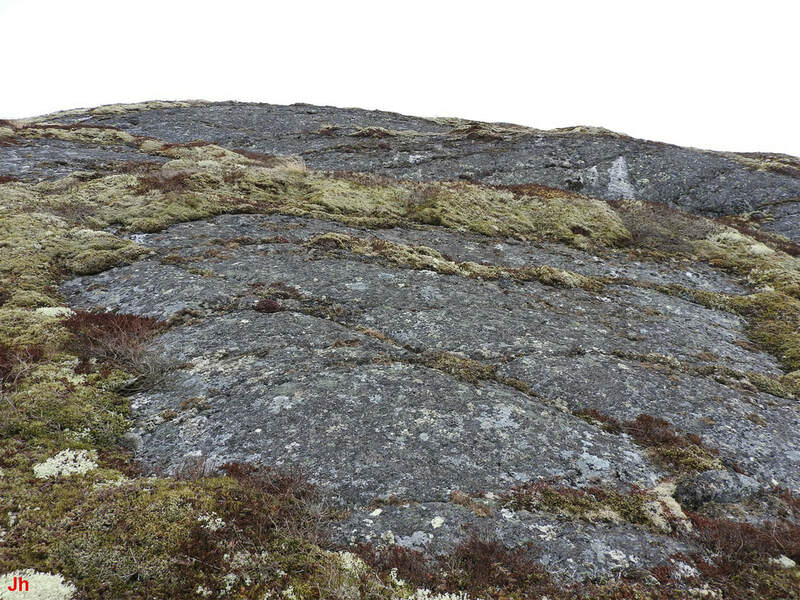 The upper photo shows bedrock in a layer directly above the area seen in the lower photo, where rock has been smoothed by basal-sliding glacial erosion. Rocks from both layers showed similar characteristics in terms of induration, foliation and jointing. It can reasonably be argued that both rock layers were exposed to similar conditions of warm-based and cold-based glacial erosion and that the difference in outcomes resulted from a difference in bedrock permeability. Specifically, it can be argued that, during a period of cold-based glaciation, groundwater was channeled preferentially through bedrock in the more-permeable lower layer. The enhanced groundwater availability caused frost heave in the slope-face of the lower layer, followed by bedrock displacement in a combination of non-tangential and tangential cold glacial ice motion. The upper layer retained the initial surface morphology imparted on the upper slope-face by earlier basal-sliding warm-based glacial erosion. The preservation of the upper-layer's glacially-smoothed surface lasted throughout the same interval of cold-based glacial conditions (thermal regime, ice loading) that shattered and shifted the rocks of the lower layer. The location described above (and other similar locations within the 5 sq. km layered volcanic landform on the Isthmus of Avalon) provides an opportunity to directly investigate the effects of bedrock permeability on subglacial bedrock frost heave. Contrasting rock samples could be selected from various layers for the purpose of permeability analysis. Such analysis would appropriately be directed at determining why groundwater penetration leading to frost heave is much more efficient in certain rocks than it is in other nearby rocks exposed to similar conditions. Cold-based glaciers move exclusively by deformation of the ice comprising them. Possible exceptions occur when cold ice fails in fracture, or when ice under extreme stress is torn away from an underlying surface in a small area and then moves relative to that surface. Warm-based glaciers also move by deformation of the ice comprising them, but the major portion of the relatively rapid movement of a warm-based glacier is achieved when ice slides relative to the underlying surface. Deformational ice motion and sliding ice motion are fundamentally different and their respective effects on underlying bedrock can be distinguished. It is thus possible to determine when bedrock has been shifted by the action of a cold-based glacier. In warm ice that is sliding, near-ground ice velocity is finite and homogeneous over a substantial area. In deforming cold ice, near-ground ice velocity approaches zero above a stable surface but the ice then accelerates when the substrate to which the ice is bonded begins to yield. 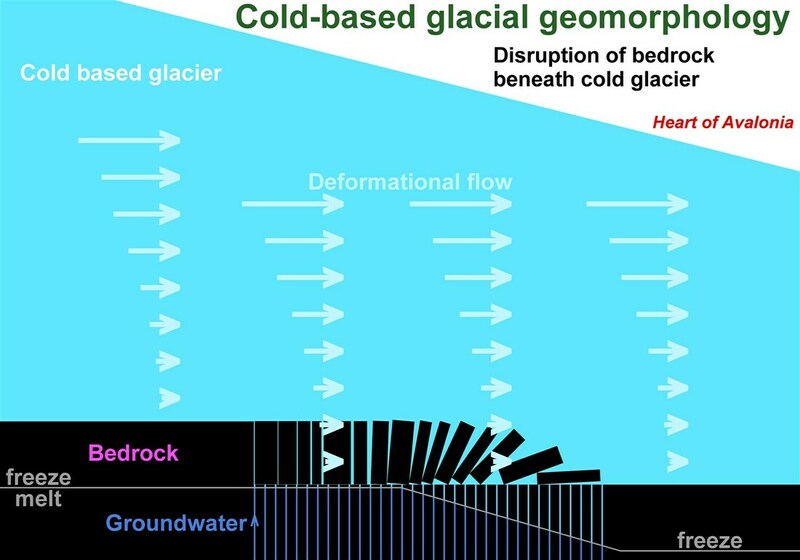 The above diagram lays out the geometry of a simplified environment where bedrock can be shifted by deformational flow in overlying cold glacial ice. The lengths of the arrows indicate ice velocity which reduces to zero approaching the ground. Shear stress, however, does not reduce to zero at ground level. Rather, the magnitude of the shear stress acting in the bedrock matches the magnitude of the shear stress causing the indicated distribution of ice deformation velocities. In the area marked "Reduced bedrock confinement" the shear stress imparted to the bedrock results in a net tensile stress. 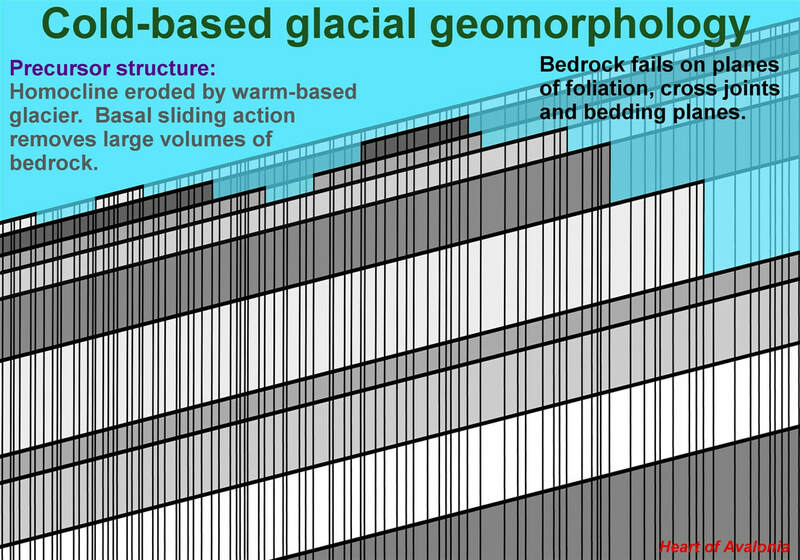 The above diagram illustrates tensile failure of shear-loaded bedrock beneath a deforming cold-based glacier. Note how near-surface ice velocities increase when the zero-surface-velocity constraint is removed. The constraint is removed because the ice velocity adjacent to a stable surface becomes nonzero when bedrock destabilizes and begins to co-move with the overlying glacial ice. The near-surface glacial ice, in effect, accelerates as bedrock beneath the ice begins to fail. This acceleration can lead to a recognizable pattern of steadily widening fissures near the point where bedrock failure initiates. 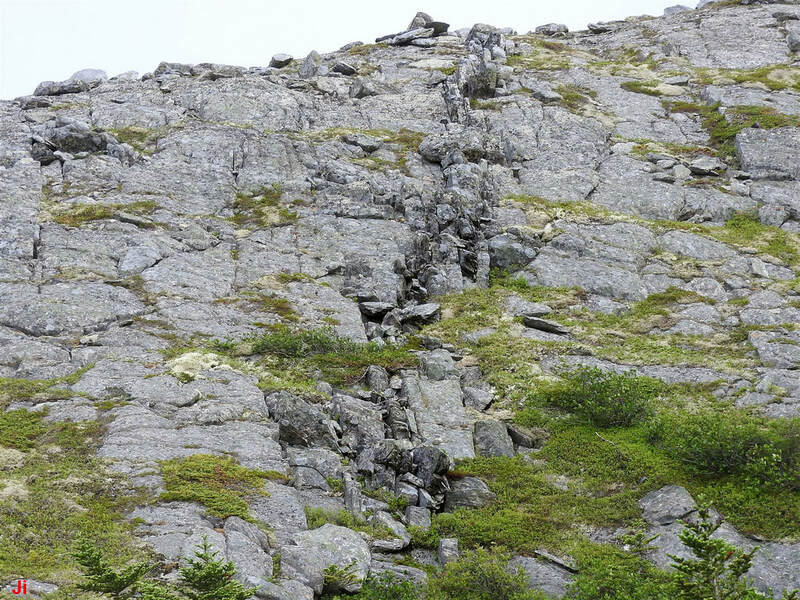 Patterns of widening fissures have been observed in the field (see below) and provide specific evidence of cold-based glacial erosion. Groundwater plays a role in facilitating the type of erosion described above when frost heave separates blocks from substrate, making the blocks more mobile, and when frost heave raises blocks into the glacier, exposing the raised blocks to concentrated loading and higher ice velocities. 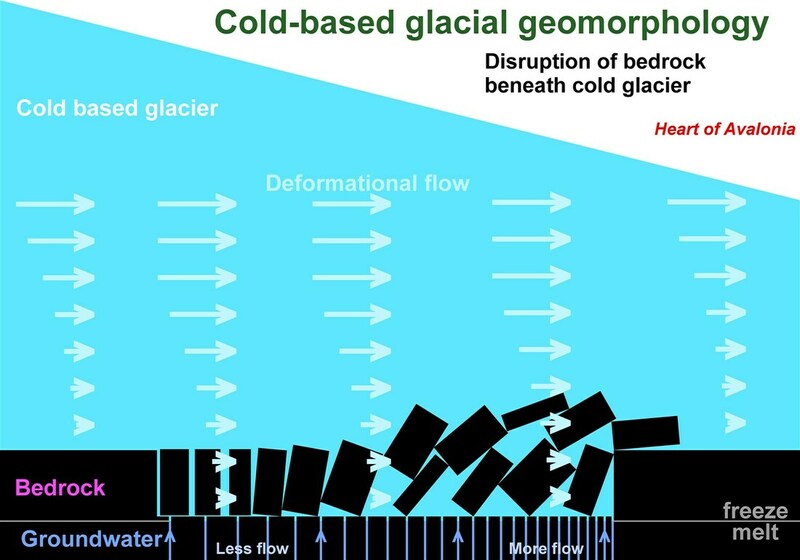 The above diagram shows an environment where localized groundwater flow and associated frost heave have initiated bedrock failure beneath a deforming cold-based glacier. Blocks on the down-ice side have been completely dislodged by vertical frost heave, reducing confinement of adjacent blocks. Shear stress applied by the deforming cold glacier is then able to induce tensile failure in up-ice bedrock and to shift the resultant detached blocks down ice. An example of the process diagrammed above is shown in the following photo. The orange strap seen in the above aerial photo is 1.0 m long. 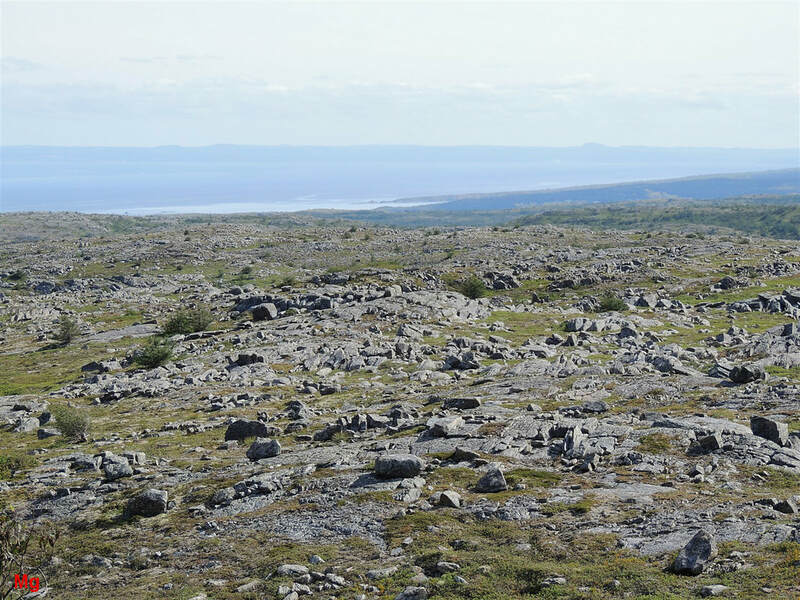 The photo shows a fairly level area of sedimentary bedrock that has been disrupted by both bedrock frost heave and the mechanical action of a cold-based glacier. Glacial ice motion (deformation, not sliding) was directed approximately from the bottom of the frame toward the top. Bedrock seen at the bottom of the frame is largely intact, although penetrated by a system of joints. Moving upward from the bottom of the frame, fissures begin to appear and the fissures become wider with increasing distance from the intact bedrock. The fissures are about 1 m deep. Blocks seen in the lower third of the frame, although separated by fissures, have not been displaced vertically by frost heave. Blocks seen in the center third of the frame have undergone significant vertical frost heave and adjacent blocks often differ in elevation by several tens of centimeters. Large ice lenses appear to have developed beneath the centrally located blocks, creating raised groups of blocks that extend to multiple square meters in area. In several instances, a few blocks have dropped back within these raised groups, leaving conspicuous depressions in an otherwise raised area. Blocks seen in the top third of the frame are largely disordered in arrangement. 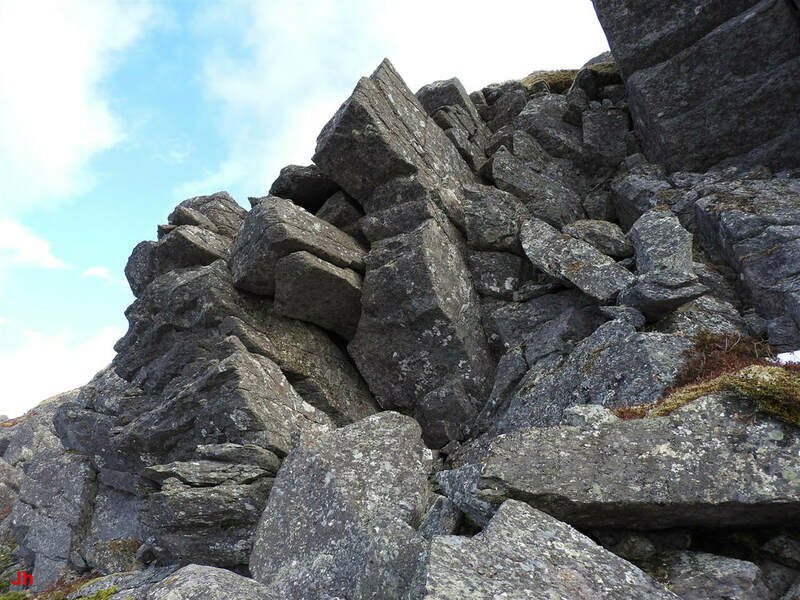 These blocks appear to have been shifted upward by frost heave until they were no longer registered in the surrounding rock. Many blocks were shifted down-ice by glacial action while others were rotated to have their tops pointing down-ice. When ambient ice eventually melted, fully dislodged blocks that were previously embedded in glacial ice were able to settle out into a disordered mound. 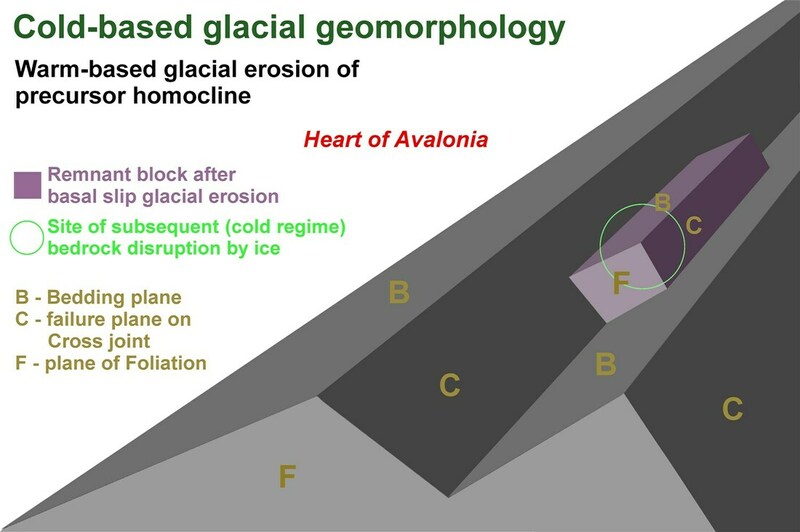 The arrangement of ice-shifted blocks seen at the location depicted above suggests that a localized eruption of subglacial ground water played a key role in forming the feature. Without concurrent subglacial frost-heave action, the loading of the bedrock by shear stress from a deforming cold glacier would have caused little or no bedrock disruption. A generally flat bedrock surface of substantial area leaves no weakly confined rock that would be subject to shift by ice-induced shear stress. Several nearby extended flat areas of bedrock that had been previously smoothed by warm-based glacial erosion were not disrupted under the shear-loading conditions that shaped the feature pictured above. 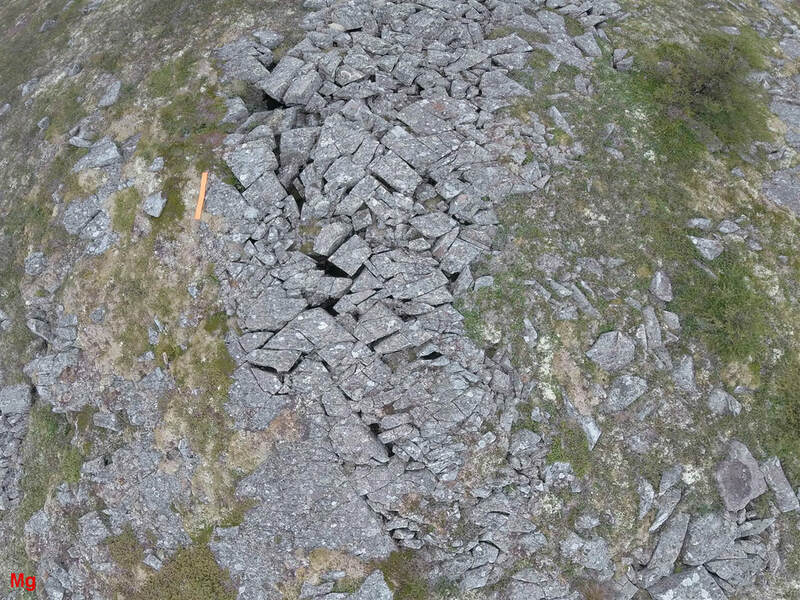 Close examination of the above-described feature confirmed a marked tendency for fissures to widen increasingly with increasing distance from stable bedrock. 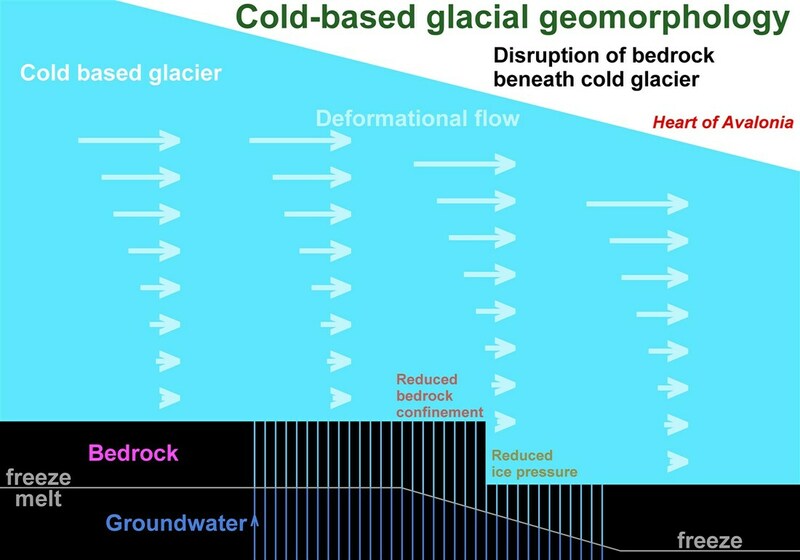 This observation supports the theory that cold ice under stress was anchored to the stable bedrock and that deformational flow of ice contacting the bedrock commenced and accelerated when blocks of loosened bedrock were able to move with the ice. Within the context of this theory, the above-described feature provides a good example demonstrating cold-based glacial mechanical action.